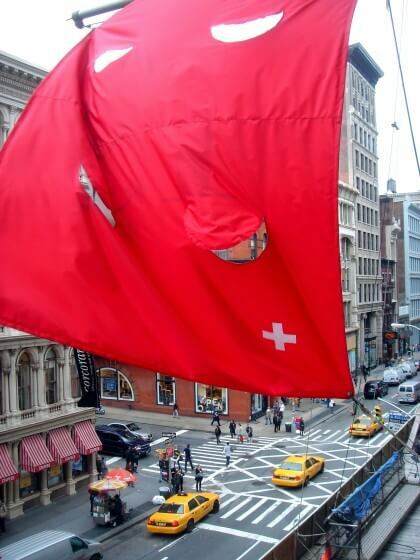 After the successful appropriations of Olaf Breuning and Olivier Mosset, the Swiss Institute commissioned Peter Regli to re-design its Swiss flag. Regli’s work often explores the interactions between institutions and public situations. For the SI, he remixes the red and white of the Swiss flag into a two faceted design; in effect, the Swiss cross is shattered into pieces like a puzzle. While waving in the wind, this face may either grin or frown at you.